With a drawer and shelf for books, and the perfect height for a lamp, our Victorian-styled nightstand is ready for bedtime story-telling. Solid wood painted turned legs and a crystal-look knob complete this elegant table. A second drawer knob is included to customize your look. 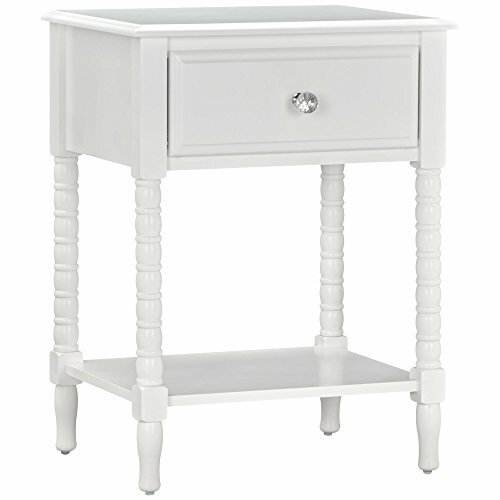 Works well as a stand-alone nightstand or as part of our Rowan-Valley Nursery and Youth bedroom collection. The Nightstand top comes preassembled, meaning you can have your new nightstand setup quickly after attaching the 4 legs! Little Seeds products, this purchase helps support a major Environmental initiative. Discover how this can help you and your child involve your community in Habitat rebuilding! Stability tested to meet or exceed tip standards. Preassembled top makes assembly easy. Little Seeds products, this purchase helps support a major Environmental initiative.